Although the cover of this book says it is "jokes for kids," it's really fine for any age. The Kindle book is subtitled: "An Abs Workout With All That Laughter!" 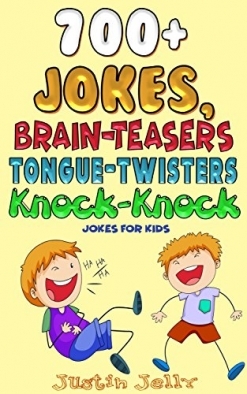 Most of the jokes are pretty silly and a lot of them are plays on words that younger kids might not get, but I'm sure older kids and adults will have fun explaining them. There are lots of tongue twisters that will trip up even the most eloquent speaker, but reading them is a little boring. The brain twisters are mostly for older kids, as math and logic are involved that younger kids won't have mastered yet. However, they would be fun short-term projects for families and groups of kids to work on together. Mixed into all of the jokes are "funny facts" that are usually more interesting than funny. Several of these are facts about farts that I'm sure will elicit screams of laughter from the boys (especially), but parents may want to monitor a few of those. My only complaint about the book is that it contains too many errors for a book geared for kids. Most of those involve capitalization of names of people and places, but I saw a few places where the wrong word was used, one where the words in a sentence were in the wrong order, etc. Since this book isn't in print, those errors should be easy to correct. All in all, this is a fun little book!